…but moving a step on from this (unfortunately not rare) extreme, how well does your voice really engage your audience? Caution: Microphone or no microphone, speakers’ voices often fail to properly project around the whole room. Self evidently, if your entire audience can’t clearly and comfortably hear you at all times, you’ll obviously lose both attention and impact. 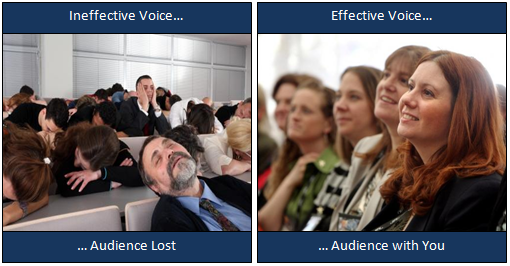 Your voice is one of your primary ‘weapons’ in taking and keeping your audience’s attention. Meaningful content delivered with conscious pausing, variation and a well-projected voice demands audience attention, so helping you produce real impact. Just wish to say your article is as astounding. The clearness in your post is just spectacular and i can assume you are an expert on this subject. Fine with your permission allow me to grab your RSS feed to keep up to date with forthcoming post. Thanks a million and please keep up the gratifying work.